Many times, the cheapest airfare back to Dublin includes a connection through Heathrow. My experiences with Heathrow have not been positive. Last week, however, I had an extraordinary exchange with the UK’s immigration service. Mind you, my experience is innocuous in comparison with asylum seekers, wearers of traditional dress, and many “foreign-looking” unfortunates. So my tale feels a little silly. But the victims of my re-telling in person seem to think it is hilarious. So here goes. I landed in Heathrow from JFK and moved toward my connecting flight to Dublin. Heathrow’s security is efficient but overwhelmed by the sheer number of passengers and the stringent application of ever-escalating regulations. I don’t object to that, although I think security theatre is a farce. The line for immigration and customs, however, was much longer than I expected. There’s a line for EU and UK passport-holders, which moved as smoothly as the First-Class security lines in the US. I stood in the line for Everybody Else. It was the first line I’d seen that overwhelmed the British love for filling waiting areas with those familiar fabric stockades. I had no desire to step on UK soil (especially with hoof-and-mouth on the loose again), so I wasn’t happy to wait in line with the international students, weary families, and few business-types who sought entry to the promised land. I was not impressed at all by the sign that I saw as I neared the immigration desks: “Due to new regulations, it may take longer to enter our country. Cheers, the UK authorities.” I don’t want to enter your country, you arrogant Brits. I also ignored the “Entry Questionnaire” that read, “For those seeking entry to the UK.” But the nice person at the head of the line asked me to fill one anyway. No problem, really — Ireland and its residents benefit, on the whole, from passing these bureaucratic duties to the UK. As with all such paperwork, the slip had some enigmatic categories, but it was generally clear. Permitted to remain in Ireland on conditions that the holder does not enter employment, does not engage in any business or profession and does not remain later than 29/8/08. For Minister for Justice, Equality & Law Reform. So, in the box marked Occupation, I wrote “None.” It seemed like the prudent choice. Much better than writing, “You’re still sitting on the Six Counties,” which wouldn’t please anyone. Yes, I guess you could say that. [Oops, that’s not a good thing to say to an immigration official!] My spouse works in Ireland, and I live with her. I keep our home, I suppose. [She crosses out “None” and begins writing “House Husb..”] So you have children? [What?] No, I’m busy enough. But you don’t have an occupation? [Stamp, ku-chunk, stamp. She hands back my passport and files her little slip.] Go through there, third right. I’ll just say this: It was fortunate, for both of us, that the third right was the exit that led to my connecting flight. I stalked away, muttering curses under my breath like an Irish nationalist. (I’m starting to learn how to add color and depth to my curses, although I’ll never have the elegant, unconscious talent of an Irish adept.) One nice thing about having a blog: My foul reaction quickly evaporated with the thought, “This is good material for a blog entry.” Thank you, loyal readers! Ha! so, really – it was just a continuation/rehashing of the conversation you endured a dozen or so times while in the States. Ah how I laughed each time I heard that conversation. Also amusing, the irritation that crept into your voice 48 hours into it. hee hee [insert evil laugh here]. LOVE IT! Also – Willem – we could enter that sacred “EU passport holders line” if dad would just pony up the birth certificate! Join me in the good fight for dual-citizenship! Better hope the Irish Authorities don’t read this blog, and kick you out now that you’ve become a writer. i just can’t believe you didn’t get cuffed and hauled away for taking a photo in a security line. p.s. so, you’re only there for a year??? Oh, Keely — the linked photos are not mine. I just found them on the flickr website, as good representations of what I saw. So I’m letting other people take the risks for me! The Irish government graciously gave me the privilege of residing in Ireland for a year. If I ask nicely (and don’t foment political unrest, commit a serious crim, or get a job) then they’ll probably give me another year. Vindication: It just feels good! BAA [British Airport Authority, fully privatized by Baroness Thatcher] faces a crackdown on queueing times at Heathrow and Gatwick after the UK’s largest airport owner was warned by the Competition Commission that passenger delays were “unacceptable”. 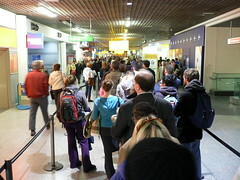 In a report on price regulation proposals for BAA, whose landing charges at its major airports are capped, the commission said its performance on security queues at Heathrow and Gatwick had been “poor”. “They have failed to manage security queuing and queue times to avoid unacceptable delays to passengers, crew and flights and consequently have not furthered the reasonable interests of the users of Heathrow and Gatwick. We consider that these effects adverse to the public interest can be remedied or prevented by the extension of the existing conditions and/or by the imposition of new conditions,” the commission said. Hey that is great news!! I love the sense of righteousness that comes with the vindication!! It’s like “The Guardian” has your back. Maybe you should invite them to view the blog? Did you see that Steven Cobert has a new book out now called. I am America (& so can you)? I would be curious to get an expatriot view on the book. Some Pakis smashed a British man’s skull in and it went unreported on TV. I’ve just sent a letter to the anti-white BBC asking why they televise British attacks on Asians but not attacks by them on us. They’re flooding into our country, getting put before our people in the queue for housing and getting all the tax-generated benefits available. it’s going to kick off. Well, on a number of occasions I’ve met extremely rude and dismissive staff at Paris’ Charles de Gaule airport. There was a hateful immigration official in Bangkok and the queues! ), and the Azerbaijan authorities were foul and extremely disorganised. The US immigration people were the pits, arrogant in the extreme, rude, and loud – and there were lots of officious notices everywhere. The queueing was pretty rotten too. Indian airport staff were chaotic. Who do they think they are with their great big chaotic country? I liked the Danish official I met, and Canadian immigration staff were lovely. The Irish were nothing out of the ordinary. No smiling eyes in evidence! The German passport checker was cold as ice and hardly a breezy welcome to his country, and as for the Russians – well, they certainly know how to rub a weary traveller up the wrong way. The Poles were OK but looked thoroughly bored, as most airport staff seem to do. I can’t even remember the Belgian officials, but I remember liking the guy in Luxembourg who checked my passport. The Ecuadorian was nondescript, but fairly efficient given the part of the world he was operating in, but the Peruvians get looking bored down to a fine art. Poker face or what! The thing is this: I really don’t hate the French, Germans, Azeris, Indians, Russians, Belgians, Ecuadorians, Peruvians, Poles, Thais, Americans or anyone else. Maybe the fact that you call yourself a “house husband” is an indication that you have too much time on you hands to conjure up these banalities in your odd mind. But the crux is: what if this article started with the statement “now I do hate the Irish”, or “now I do hate the Americans”? I only read this site because it’s so banal and silly. “Join the fun” your blogs invite. Why not stop the hate? Just stop it. It’s boring. Steve – we appreciate your taking time to write a detailed and complete post of your experiences with various passport control officials. Again, as Will has mentioned in other posts/comments, this blog was created to provide a place where we could share our experiences as Americans living abroad. Our responses to these experiences may be positive or negative — but they are our responses. I’m sure you have occasionally told a story at a party that you thought was awesome or enthralling, or even a devastating indictment of something — and then somebody didn’t like it. Well, this is our party. You’re welcome to stick around, listen to our stories and share some of your own. Your own stories have been thoughtful so far. But it’s hardly a contribution to the party when you say that you read the articles only to ridicule them. If you someday become the guy that spills wine on the rug, loudly proclaims your views to be the only option and generally become unpleasant, we’ll ask you to leave. Thanks for your reply. I really am sorry if I caused offence. I actually quite enjoyed Will’s thoughts on bacon snacks and Turkish Delight. I certainly don’t want to ruin your party. I currently live abroad and wish there was a similar forum for Brits here. But if there was, I certainly wouldn’t use it to proclaim my hate for the neighbouing countries. It wouldn’t seem right. There are pros and cons in every nation on earth, including their histories. Histories are just that though. Britain and Ireland are different countries to those which they were even thirty years ago. And for history, don’t read people. Some things annoy me about everywhere. Even my own country. But it has never led me to proclaim my hate for these places. I don’t proclaim that my opinion is the only valid one, any more than Will or other contributors. The thing is that my problem is with the Hate. Both you and Will sidestepped all of the issues I raised. I thought it might be interesting to have a good natured debate. And why shouldn’t someone who an article proclaims to hate have the right of reply? I would certainly expect a torrent of comeback if I wrote an article, and published it, proclaiming to hate another nation. Isn’t this the problem we have in the world at the moment? A lack of understanding, grudges, blind Hate, and fundamentalism. My Irish mates, and Irish sister-in-law all wish the hate would stop. It usually does when people spend time in my country and enjoy a drink down the pub. The site is lightly peppered with Hate – albeit with some slightly contradictory statements at times. What can this achieve? Hate can only achieve conflict. If you asked me to leave your party for opposing Hate, then that would be a reflection on you guys, and not me. But don’t ask me to leave without addressing my objection to the Hate. By all means, have some fun, and help your fellow expats. But cut out the blinkered Hate. I never said I hated anyone. I wasn’t unpleasant either – especially given that the word Hate was being bandied about. Maybe I should leave now? This is nasty as well. I think M. Pickling as a good argumant. You have not given him a answer. M. Pickling should deserve a answer. It gets worse! Anita Bakker sounds even more sanctimonious and illiberal that her misguided husband!